Visitorsto the Paris Air Show are being treated to a full-scale mockup of Russia'sproposed Kliper spaceliner. Themulti-use vehicle is one piece of Russia's Rosaviakosmos display at the Pairs Air Show nowunderway until June 19. Rosaviakosmos is Russia'sFederal Space Agency, with the Kliper design aproduct of that country's EnergiaRocket and Space Corporation. The exhibit includes a lookinside the Kliper (or Clipper in English), showing theplacement of passengers behind a flight crew. Russiais touting the spacecraft as a replacement for their workhorse spacecraft, theSoyuz. Much like NASA's Crew Exploration Vehicle (CEV), future destinations forthe Kliper are said to be the International Space Station, the Moon, as well asMars, according to Russian officials. It could also serve as an emergencyrescue craft for space station crews. Atthe Paris Air Show, Anatoly Perminov, head of Russia's Rosaviakosmos, has made note that both Europe and Japan haveexpressed interest in joining in on Kliper development. However, decisions werestill to be made as to how they could contribute to project, according to RIANovosti, a Russian news agency. Russian space officials forecastthat the Kliper can carry six people: two pilots with the other four seats forastronauts or space tourists. In addition, the spaceship can haul up to 1,540pounds (700 kilograms) of cargo. TheKliper could be in service in the 2010-2011timeframe. 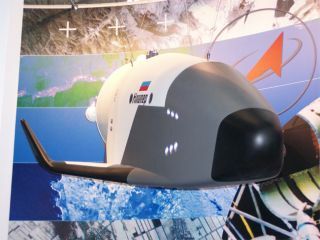 Novosti has also quoted Perminov as saying that the Klipercan be launched from European as well as Russian spaceports. Kliper's launch vehiclewould be a Russian Onega rocket--a modified version of the Soyuz carrier rocket.